The members and friends of the International Bonhoeffer Society/English Language Section mourn the death and celebrate the life of Geffrey B. Kelly (27 August 1932 – 30 May 2017). We stand together in honored memory of our esteemed colleague and beloved friend. He lived in faithfulness to his Lord and love for his family as well as in steadfast vigor for his students and collegial support of professional associates. His erudition, his eagerness for truthful critique, and his drive for social justice were evident to all who knew him. 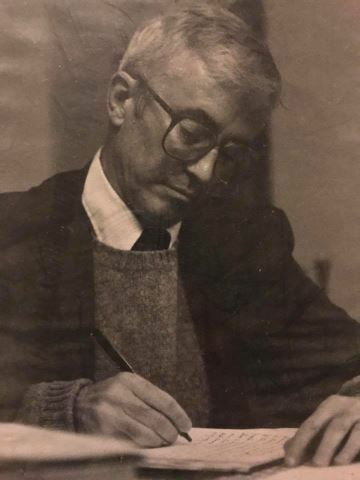 Professor Kelly was a scholar of international renown, for his teaching, his writing, and his sustained collegial support. He was a vigorous teacher over many years, noted by undergraduates and graduate students alike for his deep engagement with them in the examination and exposition of historical and contemporary moral theology and its foundational role in modern life. The central focus of his research over the course of this theological career was the place and import of Dietrich Bonhoeffer in the continuing search for meaning and impact of Christian life today. For Kelly, there was more than a close parallel with Bonhoeffer’s own ministry and mission. He sought to exemplify the depth and passion of Bonhoeffer in probing the essentials of the faith and in pursuing the realization of that faith in both public policy toward compassion and justice and in the ordinary precincts of life. Kelly’s creative scholarly work exemplifies fully this focus and passion. His several books and many articles centered on the theme of ethical responsibility, rooted in a career-long examination of Bonhoeffer’s theological development and ethical reflection. In any close discussion with him, it became immediately evident that Bonhoeffer was both the most important interpreter of the challenges of faith for a Christian today but also an immediate companion in the myriad moral challenges of our own time. His interests are reflected early in his career. As a member of a Roman Catholic order, the Christian Brothers, Kelly had a foundation in classical languages, was an expert linguist with fluency in German and French. His doctoral dissertation at Louvain University (1970) centered on Bonhoeffer’s doctrine of revelation in relation to the theology of Karl Barth. His facility in French led him to Jean Lasserre, one of Bonhoeffer’s closest friends, and the publication of a most valuable interview dealing with Bonhoeffer’s early development. Kelly’s contribution to the Bonhoeffer studies and to the wider Bonhoeffer Society was marked by a special interest and facility in collaborative work. An early example of this was his effort with John Godsey to bring forward the wide array and variety of Bonhoeffer’s influence on the witness of the churches. The high point of such joint efforts is reflected in Kelly’s collaboration with his close friend and colleague, Burton Nelson, in works that combined access to Bonhoeffer’s own writings and interpretive guidance. This effort to provide reliable and sophisticated English translations of the most significant Bonhoeffer writings illustrated both a pedagogical interest and his driving concern for the place of Bonhoeffer in the life of the churches. In this way, Kelly was a key early influence in the life of English Language Section of the International Bonhoeffer Society toward its own translation efforts. These interests and efforts reached significant fruition in Kelly’s editorial skills in two of the volumes of the Society’s 17-volume English translation of the German critical edition of Bonhoeffer’s entire corpus (Dietrich Bonhoeffer Works): volume 5, Life Together, and volume 4, Discipleship (with John Godsey). Kelly’s initial place and consistent influence in the Bonhoeffer circle is noteworthy. The Bonhoeffer Society/English Language Section had its genesis following the first International Bonhoeffer Congress in Düsseldorf in 1971. Kelly was one of the four “founding fathers” who gathered in Baltimore in October 1973, to plan for a professional association devoted to Bonhoeffer studies among English language scholars, pastors, and interested students. He was the first Society secretary, a post that he held for many years in ways both thorough and delightfully idiosyncratic. He became quite literally the Society notary, employing his gregarious nature and generous spirit in a steady stream of letters and notes toward building the membership of the Society and especially in support of younger scholars. He also used his position as an avenue for a playful spirit in the manner of mischievous minutes of meetings, genuinely sui generis, as a near legendary Irish emcee of Society social events, including the impromptu awarding of “papal blessings,” ever a dubious honor, to say nothing about his encouragement of a sub rosa strategy of “burying” Society costs within institutional budgets of the various Society officers. Kelly became the second President of the Society and for more than a decade led the Society’s official meetings with aplomb, although with a rather unusual sense of parliamentary order. He was a mainstay at virtually every annual meeting of the Society and at all of the quadrennial international Congresses, including the most recent Bonhoeffer Congress last July in Basel. Geff was remarkable in so many ways. He endeared himself to his colleagues and friends through his gifts of time and valuable counsel, especially to those early in their career and for those of us who valued his counsel in the enormous effort over nearly three decades on the critical edition in English. From the exuberant, even joyous manner that he exhibited at the Society gatherings, it was obvious to all that the Bonhoeffer Society and its members and friends were very important in his life. After Geff’s departure from the Christian Brothers and his marriage to his wife, Joan, his colleagues and friends treasured them both over the years with their children (Susan, Brendan, and Michael). He was a warm, gentle, and gracious person who carried as well a sharp, prophetic voice, a welcomed combination celebrated by the Society and those who walked with Geff. He will be deeply missed. "I'm sure all of us could repeat fond memories of Geff such as those John de Gruchy mentioned, not least the mischievous minutes of meetings, Geff’s "papal blessings" distributed to all and sundry, and his greetings from Philadelphia, the "city of brotherly love," which he so genuinely sent to us in message after message. So here is a bit more information you can add to what you glean from the emails of others. Geff Kelly was a founding member of the English Language Section of the Bonhoeffer Society. Following the first International Bonhoeffer Congress in Duesseldorf in October 1971, Geff was one of four members of a steering committee who met in Baltimore on October 26, 1973, thus making him a grandparent of our Section. This led to the first AAR meeting of the Bonhoeffer Society which was held in Washington, DC in October, 1974, and Geff was elected the first secretary of the Society. In addition to his inimitable minutes, Geff was a proactive and tireless secretary who established personal relationships with new members by writing innumerable friendly notes in that pre-email age. He also invented the strategy he called "burying," according to which expenses of the Society such as printing, mailing, and phoning should become involuntary contributions of the institutions where the Society officers were faculty. Younger members of the Society, who have for years known Geff's wife Joan and their daughter Susan, may not know that in those early pre-marital days he was a member of the order of Christian Brothers. His doctorate, completed at Louvain in 1970, was on Bonhoeffer's doctrine of revelation in relation to Karl Barth's theology. Geff was an expert linguist, at home in classical languages and fluent in German and French. His expertise in French led him to Jean Lasserre with whom he conducted a lengthy interview and a published article, and his German proficiency served his editing of Life Together and Discipleship (with John Godsey) in DBWE." "Seeing this is going to so many good 'old' Bonhoeffer friends, let me add my own word of gratitude for the life and friendship of Geff, and the many wonderful times spent with him within the Bonhoeffer Society circle. I first met him in Geneva in 1976 and over the years we became good friends, as did all of you. He was far more than an excellent scholar, he was a warm, gentle and gracious human being, but also a sharp prophetic voice with a deep sense of justice. And, of course, he had an outrageous Irish sense of humour that turned minutes of Society meetings into "must read" documents. We will miss him immensely."